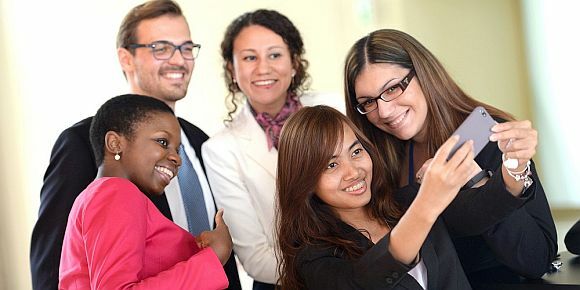 The Master’s in Management (MIM) is a two-year, pre-experience program, designed to teach students how to enhance the skills developed during their undergraduate studies, and how to apply them to economic analysis, product development, and new technology management within the global marketplace. Students with any previous degree are welcome to apply to the MIM. Corporate exposure and experience: ESMT MIM students complete up to 11 months of applied study: an internship, a social impact project, and a thesis project. ESMT has a growing corporate partnership with a variety of global companies who offer internships and projects. Two tracks - tailored to your skills: Courses integrate qualitative analysis into applied methods for global business management so that graduates can work in a fast-paced business setting and work successfully with technology-based products and services on a global scale. International aptitude and social impact: At ESMT, Germany's most international business school, courses are taught by international faculty trained in the world's top institutions. Classes all have an exceptionally diverse student body. MIM candidates are going to study either German or a further foreign language. All students are encouraged to spend time abroad on projects and internships where possible. Soft skills for high-growth careers: ESMT's small class sizes and applied approach ensures that students gain valuable presentation and teamwork experience. Further seminars focus on conflict management, diplomatic communication, negotiation simulations, and other skills likely to be the difference between a graduate's stagnation or promotion. ESMT is accredited by German, European, and US accrediting bodies (triple-accredited). This ensures a high-quality educational experience and a degree with a solid reputation throughout the world. ESMT currently holds rankings in a number of publications, including appearances in the Financial Times, The Economist, Bloomberg Businessweek and Handelsblatt. A previous degree (at least Bachelor's equivalent). Applications will also be accepted from final-year undergraduate students awaiting completion of their degree. Proof of strong quantitative abilities to enroll in the Quantitative Business stream, either through previous coursework during the bachelor's studies or a GMAT/GRE score. In order to enroll in the Innovative Management stream, students with a degree in any discipline and excellent grades are welcome to apply. Proof of English fluency (TOEFL minimum of 95 or equivalent for non-native speakers). Our code is 8707. ESMT's Master's in Management program lasts 24 months. Candidates begin their studies in September of every year. ESMT's next MIM cohort starts in September 2018. This class will graduate in September 2020 with a M.Sc. in Management, worth 120 ECTS credits. MIM students should budget enough money to pay for an apartment or room in a shared flat, public transportation, food, insurance, books, and entertainment. We recommend budgeting about € 1,000 - €1,500 a month. Many internship and master's thesis projects will be compensated by the company employing the student. This is common practice among larger German companies, although less common in start-ups. ESMT offers partial tuition scholarships for accepted Master's in Management students who show academic merit. Scholarships are allocated based on academic excellence, personal and professional achievement, leadership potential, and interpersonal skills. To receive a scholarship, candidates first apply to the Master's in Management program. There is an extra essay available for applicants to explain their suitability for a scholarship.